When watching a feature film you’d be surprised at the amount of CGI is in each scene that you don’t even notice. And that’s how SFX companies like it. Of course, sometimes it’s very obvious. Melbourne based Iloura were the creatives behind the title character of Ted, Seth McFarlane’s first live action feature. Executive Producer of Iloura’s film branch, Simon Rosenthal, spoke to Rebecca on the phone about the creative process and the often ‘living in the shadows’ life of CGI. Gen Bailey is a woman full of heart. Her documentary, I Am Eleven follows the life of a bunch of 11 year olds all across the globe as they tell us about the dreams, aspirations and their thoughts on the world they’re about to enter into as teenagers. She’s chosen to self distribute the film and it has succeeded all expectations. Jordan caught of with Gen and asked her about her project and her love of the documentary format. The Australian crowdfunding platform Pozible is changing the way film is financed and WA government film body ScreenWest is taking advantage of the change. They’ve just announced that they will match any amount that any WA film receives on Pozible. Rebecca spoke to ScreenWest’s Digital Project Manager Michelle Glaser to get the low down on the new initiative. Genevieve Bailey got into the film scene early, shooting backyard videos from 8 years old. Since then she has made over 40 shorts, documentaries and music videos that have screened internationally at festivals and received over 25 awards. Her first feature doco, I Am Eleven is screening at The Mercury in Adelaide and in select cinemas across the country. Shot across 15 countries in 12 languages, I Am Eleven follows the story of eleven year olds and what they have to say about the world. Our new addition to the Behind the Screens team, Jordan Archer, talks to Gen about the filming process. Tune in next week for the second part of the interview. The 2012 SA Raw Nerve finalist have been announced. We bang on a bit about Raw Nerve as it’s one of the first steps on the film funding ladder, something many filmmakers have to climb if they want to pursue the funding model of filmmaking. Eleanor Perry, is one of the producers behind the three selected films, The Colour of Kerosene. She came into the studio to chat about the film, the pre production process and her day job working on children’s TV. 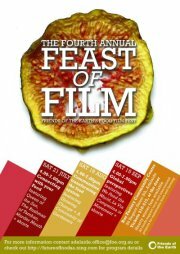 Feast of Film is a cinematic celebration of good food and farming spread over three months. Screening at the Box Factory Community Centre in the CBD, FoF is showcasing local and international films all about our relationship with food, including 2010 SA Raw Nerve film, Murder Mouth. Curator and coordinator, Kim Hall, spoke to us about the idea behind the festival and what can we expect to see. In light of the tragic shooting at the midnight screening of The Dark Knight Rises in Aurora, Colarado, we spoke briefly on the responses by Warner Bros studios and the filmmakers. “Are You Having A Laugh?” – The Beat Co. The Logger Is Dead. What is the Logger? It’s how we record our programs to be able to provide these lovely podcasts for you. Unfortunately the logger was not working this morning. So we begin this post with a apology, from us, to you, that unless you heard the show live, you missed out on something quite awesome. 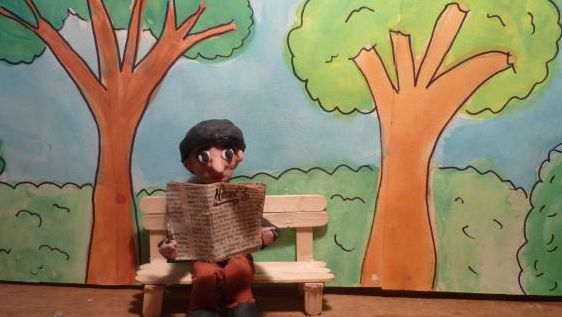 To make a film is always a massive undertaking, but imagine making a stop-motion animation while still at school! Thirteen-year-old Lotte Sweeney spent five hours, taking over 400 shots to make her short film “Weather“, about a man’s journey to the park that gets interrupted by the weather. She spoke to us about her film and what went into making it. Lotte’s film aired as part of the Little Big Shots International Film Festival, an annual event hosted by the Adelaide Festival Centre that is focussed on kids films. “Weather” was one of five films airing that was produced by South Australian filmmakers. Entries for the 2013 festival reopen in September and will close in December 2012. Here at Behind the Screens Rolf de Heer’s film “The King is Dead” has been a focus for the last couple of weeks. The film is focussed on one man’s experiences with his neighbours, both good and bad. Roman Vaculik played the character of Otto in the film, one of King’s good neighbours. He spoke to us about the organic experience of being on set working with Rolf de Heer, as well as what it was like to star in the BankSA Crime Stoppers ad we’ve all seen on TV. “The King is Dead” arrives in local cinemas this Thursday, July 19 2012, which happens to be the same day as Batman, but perhaps you should go see this one first! Two weeks ago Chrissy and Rebecca hosted a Q&A with director Rolf de Heer and actor Gary Waddell, about the film, and you can listen to a nice long cut of the session here, thanks to production extraordinaire Don Balaz who was there to record the whole thing! And apologies again, but you can’t download our whole program, tune in and/or check out the podcasts for next week’s show!